Even as traders and investors maintain a bullish outlook, XRP/USD monthly losses are high. Because of Oct 29 losses, we shall revert back to neutral, holding off trading now that our stops at 45 cents were hit on Monday. Encouragingly, the hype around Ripple’s achievement, XRP may find support at 40 cents and perhaps steer a comeback. Clearly, digital assets are not like stocks. The latter are more stable and react to prices—fast! Unlike stocks, XRP is a sought after assets. The coin became a talk in this space in late Sep when prices more than tripled before ecstatic buys came to a halt. Consequent correction did sober traders but by that time the market newfound trend was clear. It seemed to be a bullish quarter until now. A look at different crypto exchanges hint of drying volumes as Bitcoin dominance increase. So far, there is literally no demand for XRP as it was the case during the mini-rally. Instead periphery coins as EOS, Monero and surprisingly Waltonchain are dominating Bithumb and other SE Asia exchanges. Surprisingly, this comes at a time when news of Ripple achievements is all over the web. In fact from recent XRP Markets Report, institutional demand for XRP is up 450 percent from Q2 while all other metrics are simply on an uptrend. At the same time, more exchanges as XRP United are domiciling their pairs in XRP becoming direct beneficiaries of the platform’s speed, reliability and cost cuttings. 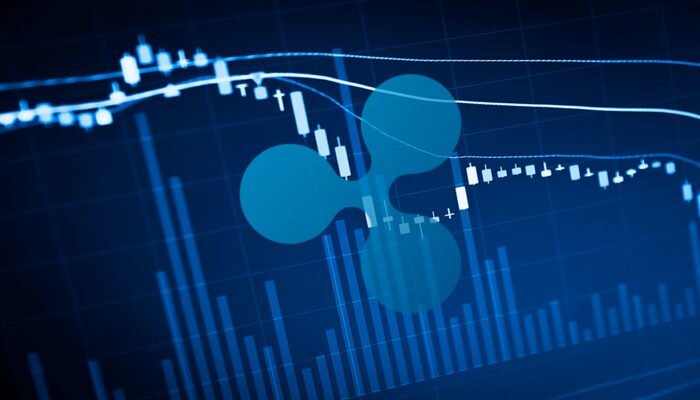 While XRP investment avenues expand, Ripple is forging new relationships with corporations, payment processors and spearheads a Washington Lobbying Group advocating for reasonable crypto regulation. After dropping 23 percent in the last month, the XRP/USD pair is the biggest loser in the top 10. Regardless, bulls should remain steady in their position because even if prices are trudging, XRP/USD is trending well within our ideal reversal zone. When we paste a simple Fibonacci retracement tool between Sep high low, it’s clear that prices are trending at levels where historically assets trend to resume trend. Therefore, despite the overall sentiment around altcoin momentum drop, XRP is solid and bullish. In fact XRP/USD is trending inside week ending Oct 22 and still inside the all important week ending Sep 23. As such, unless there are drops below 35 cents-40 cents main support, our previous XRP/USD trade plan is still valid. 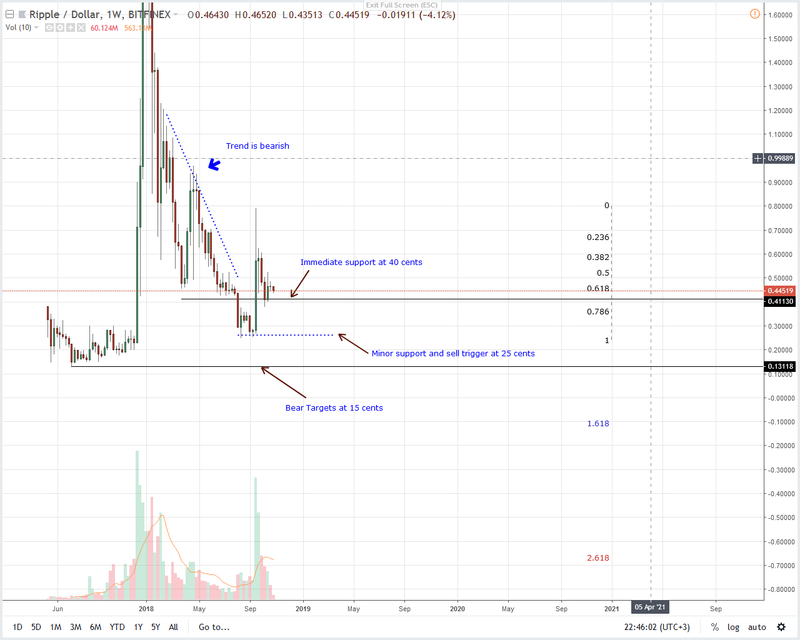 In our previous XRP/USD price analysis, we had recommended traders to initiate long trades once prices rally above 55 cents or the 50 percent Fibonacci retracement level. But this appears to be a tall order. 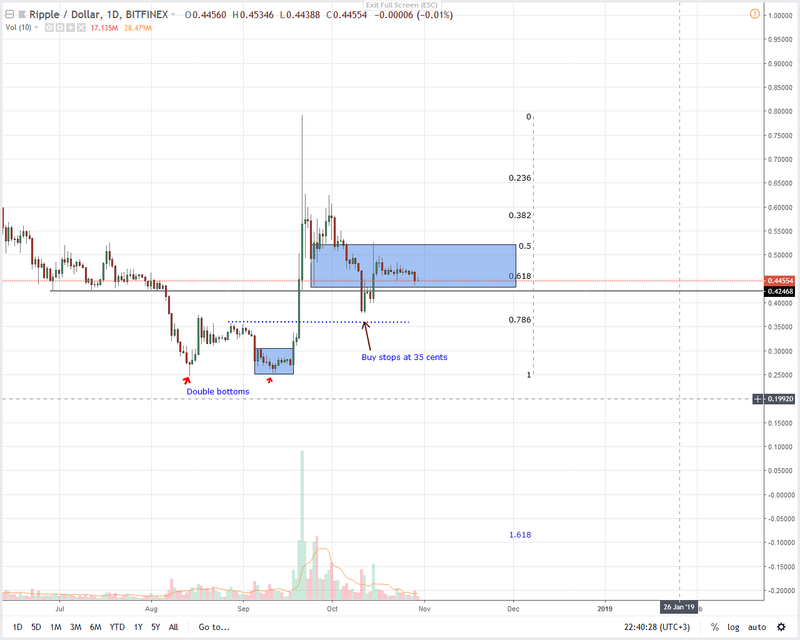 Instead it is likely that XRP/USD will drop below the 78.6 percent or the lower limit of our reversal zone at 40 cents as sellers pick up momentum. In any case, bear momentum magnification could lead to reversal of week ending Sep 23 gains. But for now, we hold a neutral position with a cautious outlook. Should today close lower then we wait to see how XRP/USD pair react at 35 cents-40 cents main support.